I believe we should encourage children to sing and play instruments from an early age. Charles Bossert has been performing for nearly thirty years and has been teaching for 25 years. He graduated from Ithaca College with his Bachelor's in Music Performance and Bachelor's in Music Education. He has also studied at Potsdam College in their Music Performance area. 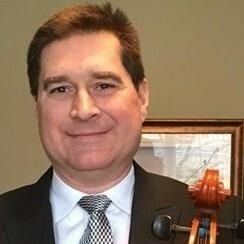 Charles has performed with the Chamber Orchestra of Northern New York, the Crane School of Music Symphony and the Pennfield Symphony. He is also a certified ISSMA Adjudicator and has participated in the Tippecanoe Music Festival Teacher's Association Jr. Festival. He has spent his free time performing at weddings, social gatherings, musicals and more. Charles offers lesson for violin, viola, cello, and upright bass beginning at the age of five.